What Is A Windshield, Really? The modern windshield has been around since the early nineteen-hundreds. Windshields provide an enclosed environment in the vehicle, while allowing the drive to see the road ahead. 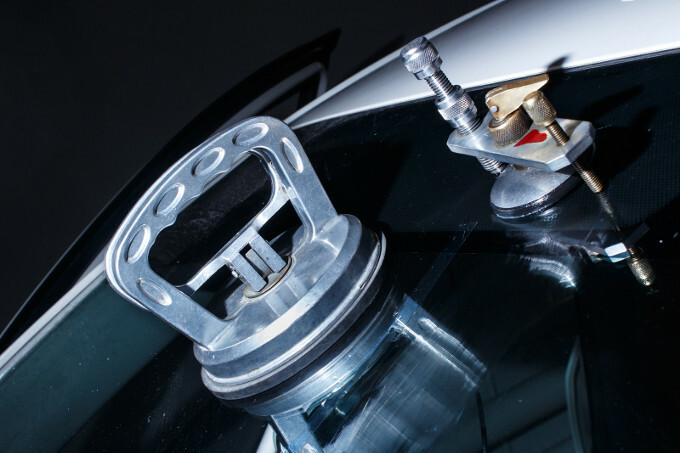 Windshields are produced in a variety of materials, and are used for a number of different vehicle types. The same windshield that is in your family’s sedan is used in a high-performance drag-racer and an orbiting rocket. But how is your everyday windshield made? There was … a simple sheet of clear glass. This glass is scoured and shaped to fit the vehicle it will be installed into. A hot torch travels over the scouring marks, and the shape pops right out of the glass sheet. The scouring and torching tactic allows the resulting cut to be as clean as possible, with as few jagged edges as possible. But nothing is perfect. The glass shape’s edges are further smoothed by a sanding and polishing method called “seaming.” The glass form is washed with soapy water, and it’s on to the next thing. Each sheet is sprayed with a non-stick substance. Usually, talcum powder and water mixed is enough to prevent the sheets from sticking to one another when they are stacked. Two sheets, identical in size and shape, are stacked together; but this is actually only a temporary arrangement. A third layer will later be placed between the two sheets of glass. Next, a black outline is silk-screened on to the windshield. This thick, non-transparent border is used, mostly, to hide unsightly aspects surrounding the windshield. In other words, this is mainly a cosmetic application. After this, a quick visual inspection is made to ensure the windshield is free of cracks, scratches, or screening imperfections. After the inspection, the windshield is placed onto a bending iron. The glass and the iron are placed, together, into a special type of oven, called a bending leer. This oven heats the glass and iron to 1,382 degrees Fahrenheit. While it heats, the glass “melts” or sinks to match up with the iron, ensuring the correct bend. Once the bending is completed, the glass goes through a slow cooling process which hardens and strengthens the windshield. When it is fully cooled, lamination begins. A sheet of vinyl, cut to the shape of the windshield is placed on top of the first sheet of glass. Another identical glass sheet is placed on top of the vinyl. At this stage, the windshield is opaque; nothing can be seen through the windshield. The vinyl will not become clear until further processing is completed. The windshield is now sent through a machine called a nipper. The windshield is squeezed between rollers to push air pockets out of the vinyl, which makes it more transparent. The brackets for the rearview mirror are applied, and the windshield is placed in a machine called an autoclave. This autoclave is used like a giant pressure cooker. When this process is finished, the windshield is completely transparent; it is a clear sheet of laminated glass. At this point, the glass is technically able to sold, wholesale; but a series of inspections and tests are generally performed prior to the windshield leaving the factory. One of the most popular tests performed on new windshields is the Steel Ball Test. A steel ball is dropped onto the glass from various heights. The ball is meant to represent a passenger’s head. The different heights from which the ball is dropped are directly relational to differing levels of impact in a crash. If the ball does not break through the glass at the required levels, the windshield is passed on, along with the others in its batch. The glass is then viewed under polarized light which can reveal any stress defects. Trained inspectors carefully review each windshield for these stress markers; any windshield possessing defects are removed from the batch. If the windshield passes these tests, they are ready to be shipped and sold to various auto makers and glass shops across the nation. The windshield in your car went through this same rigorous process. We rely on our windshield to protect our lives, not to mention our hair-dos. Take care of your windshield, and it will take care of you.